I don’t know if I’ll stop playing Overwatch anytime soon. The game is two years old and I’ve racked up an almost embarrassing amount of time on the game. The gameplay is great, but I’m also a big fan of the game’s world. The futuristic, almost comic book-like setting makes for great sci-fi and of course, great monsters. I’ve dipped into this well a few times, but I think it’s time to go back and take a look at the last omnic in the game (so far). Let’s look at Zenyatta! Orb of Destruction (Ex) Zenyatta can fire an orb at a target within 60 feet. Orb of Discord (Ex) As a swift action, Zenyatta can place an orb of discord on a target within 30 feet. A creature that attacks a target with an orb of discord receives a +2 bonus to attack and damage rolls against that target. If the target moves further than 30 feet from Zenyatta or outside of his line of sight, the target loses the orb of discord. Only one orb of discord can be in effect at a time. Placing an orb of discord on a different target removes it from a previous target. Orb of Harmony (Ex) As a swift action, Zenyatta can place an orb of harmony on a target within 30 feet. A creature with an orb of harmony gains fast healing 1. If the target moves further than 30 feet from Zenyatta or outside of his line of sight, the target loses the orb of harmony. Only one orb of harmony can be in effect at a time. Placing an orb of harmony on a different target removes it from a previous target. Orb Volley (Ex) As a full action, Zenyatta can fire multiple orbs of destruction at a target within 60 feet. Zenyatta attacks with a +15 bonus and deals 8d6 points of damage on a successful hit. 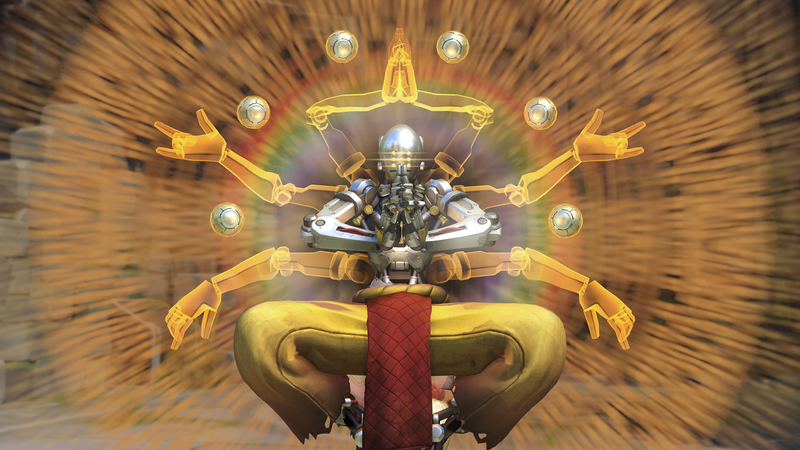 Transcendence (Ex) Once per day as a full action, Zenyatta channels a tremendous amount of positive energy. All allies within 30 feet recover 6d8 hit points. Zenyatta is an omnic, a unique type of intelligent construct. 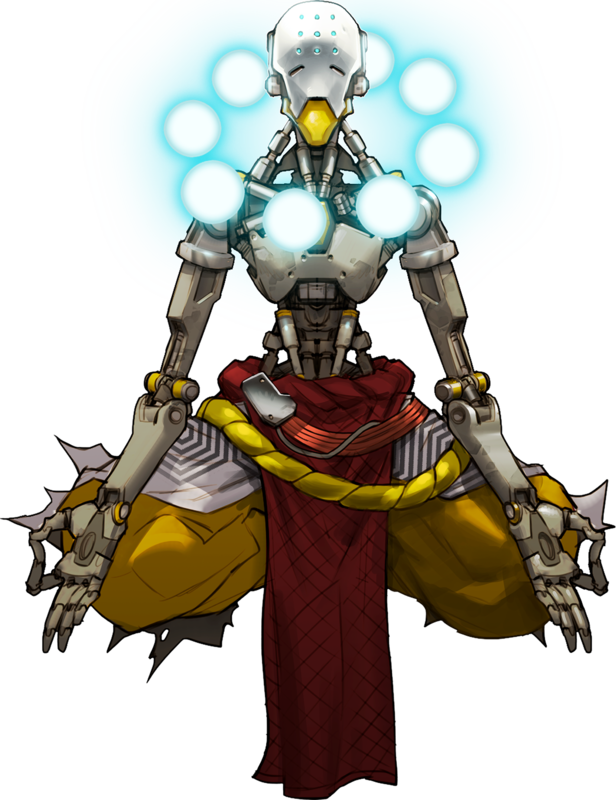 Zenyatta served as a monk at an omnic monastery. He has since abandoned the monastery and travels the world in search of spiritual enlightenment. He believes in establishing relationships to eventually unite society and heal all worlds. Although he intends to heal through engagement and personal interaction, Zenyatta also vows to protect the innocent, be they omnic or human, whenever possible. In the game, Zenyatta fills a supporting role, providing healing for allies and also providing a boost for the more damaging heroes. That’s not to say Zenyatta can’t be dangerous, as any hero can be in the right hands. For the stat block, I wanted to make sure all of his iconic abilities made it through, even if it mean that the stat block would have more abilities than usual. His basic attack is there in the form of the orb of destruction, as well as the super-charged volley. His orbs of discord and harmony were interesting as this kind of mechanic feels very much like something that would be more common in Pathfinder than in Starfinder. I decided to make sure that the values were not too over the top and I may have ended up a little on the low end. Finally, transcendence was a challenge in that there’s no real way to replicate the healing over time that it provides without taking Zenyatta out of the fight for several rounds. I opted for a massive heal rather than the fun, fast moving ult from the game. That’s it for this week! 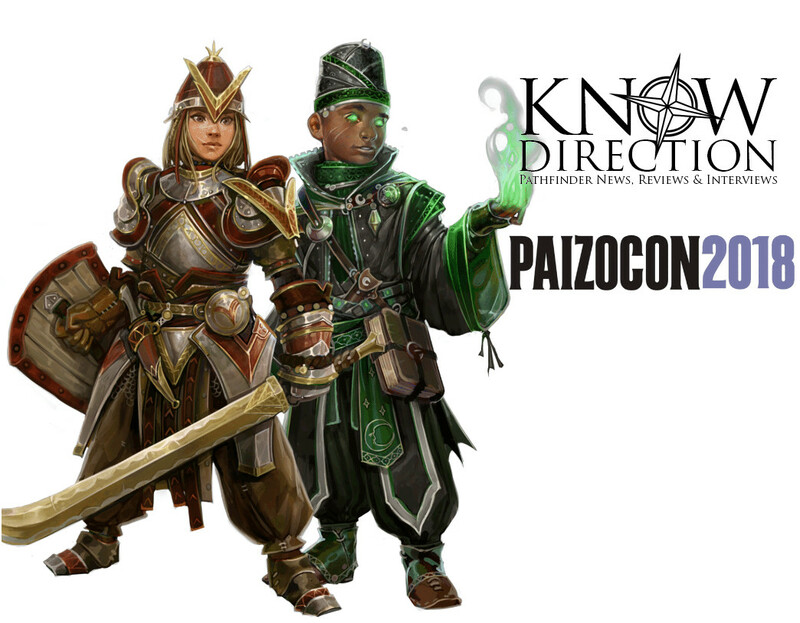 If you end up introducing Zenyatta into your game or you have any request for a future Monstrous Physique, please drop me a line at KnowDirection@hotmail.com. Nice conversion of Zenyatta. Article title still says Big Daddy from BioShock though.